← Phil Wood – Rest in Peace. We recently had a local writer come down and experience bike polo for his first time he got some great footage and video to boot too! “I’ve always been mistrustful of bike people. Thousand dollar rides. Tight shirts and ugly logos. Thinking they’re cars when they lollygag on tight streets in front of the 168 roaring horses of my Volvo. The word Shimano. If anyone is passing through Ann Arbor and wants to play polo hit us up! We are always down for a game! 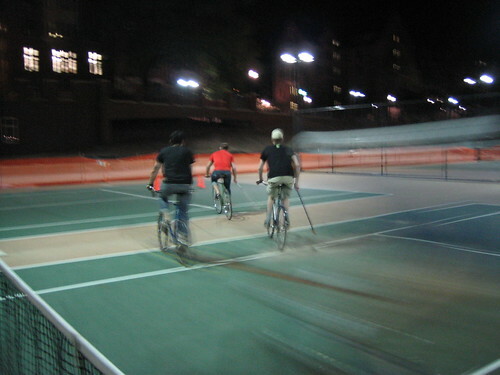 You can find more about Ann Arbor Bike Polo through here , Twitter – A2 Bike Polo and also Facebook – Ann Arbor Bike Polo. This entry was posted in a2, a2 bike polo, ann arbor, bike, bike polo, bikes, community, cycling, polo, spring, tips and tagged a2 bikegeek, ann arbor, annarbor, bike, bike polo, bikepolo, bikes, fixed gear, fletcher parking structure, palmer field, wu-tang clan. Bookmark the permalink.